​One of the products I have found by research that will help with toxin removal, Poisoning and so much more. 100% free of chemicals and pesticides. As I always say "SIMPLY THE BEST"
Seagate is unusual in the health food industry because we harvest and process our own raw materials, including cactus, grapes and olive leaves. A recent project, freeze-dried sweet organic carrot powder has even required that we operate our own organic farm in order to produce carrots that are 100% free of chemicals and pesticides. 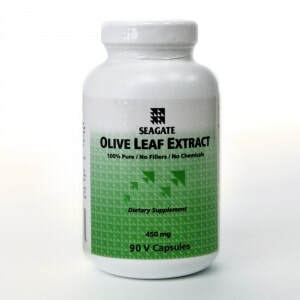 Uses: Olive leaf Extract is a natural health food for keeping you feeling well. However, this product is not a medicine. A good source of additional information is Dr. Morton Walker's article published in the Townsend Letter describing Seagate's Olive Leaf Extract. Click Here to download the PDF version of the article. The Source: Seagate employees hand select our olive leaves from local trees immediately after the olives are harvested each winter. This is the moment of highest level of phytochemical and antioxidant activity once the fruit has ripened. Manufacture: Seagate employs a cold-press freshwater extraction process, without the use of any chemicals, solvents, or alcohol. We use a mechanical process to crush the leaves, before they are placed in a freshwater bath where the phytochemicals are dissolved. Specially-designed vacuum tanks are then used to recover both dissolved and undissolved solids. This is a whole herb extract that carefully concentrates all the phytochemicals provided by Nature, without having any residual solvent appear in the finished product, and without altering the delicate structure and balance of the phytochemicals and nutritional components of the olive leaf. Oleuropein controversy: The oleuropein contained in this Seagate product is just one element of the array of active phytochemicals found in the olive leaf which some companies have mistakenly used as their measure of potency. Seagate uses independent laboratories to test our finished product for quality and purity, as we do for all our other products. Click here to learn more about about this controversy of companies mislabeling products and misidentifying their active ingredients. Side Effects: Olive leaves have been used safely for thousands of years as a food. The only known side-effect is the possibility of a Herxheimer reaction, an allergic response caused by the rapid die-off of fungi that release toxins which may temporarily cause a brief allergic reaction, lasting for several days. Purity: There is no filler or excipient in this or any Seagate product. It is 100% pure, derived only from olive leaves. The product color can naturally vary between light brown and green, depending upon the olive groves being utilized, and to the amount of rainfall and local temperature conditions during the year preceding harvest. Application: Suggested use: Take 2 to 4 capsules per day as a maintenance level. Take 4 to 9 capsules per day for additional support.Olive leaf can be taken with or between meals; although it is preferable to be taken one half hour before meal time. For throat irritations, you can open a capsule, dissolve the powder in 4 oz. of warm water, and gargle and swallow to help sooth your throat. The powder from this capsule can also be applied topically directly onto external skin irritations – a drop or two of water can be added to make a paste and gently rubbed into the skin. The skin will absorb the powder and its light green natural coloring. (The color will wash off with soap and water.) For irritations of the mouth or gums, pack some powder directly onto the irritated tissue and allow it to slowly dissolve. Value: One Seagate 450 mg. capsule costs about the same as the 250 mg. capsules made by many of our competitors. We are able to provide better value because we do not purchase our raw material from other dealers. Seagate harvests and performs the entire extraction process in our own plant. Seagate is now able to realize cost economies from processing over 34 health food products within the same plant. It is amazing how much money is spent on remedies, doctor visits, and when things get serious… antibiotics and other prescription drugs. However, I prefer to teach you what can help you to avoid getting sick in the first place. I recommend taking Olive Leaf Extract as your best bet at staying healthy. Throat irritations – Empty a capsule into 2-4 oz of water, gargle and swallow. This information is for educational purposes only and is not intended as a substitute for sound medical advice. It is presented with the complete understanding that all authors and contributors of this web site have neither liability nor responsibility to any person or entity for any injury, loss or damage caused or alleged to be caused by any information within the web site. By viewing this web site you agree to take full responsibility and liability for the dissemination of the information and understand that you need to seek out advice from a trained health care professional in all matters pertaining to your physical health. Medical supervision is advised for pregnant or lactating mothers and young children. If any side effects are noted, discontinue use and consult a trained, licensed healthcare professional.